On Thursday I took the day off. I wish I could tell you it was spontaneous but I don’t really do spontaneity. The day off was mooted on 25th September and the earliest date I could find in my diary which wouldn’t upset anyone else’s plans with me was 9th October. Make of that what you will. I went with my old pal M and we re-visited Hampstead Heath which we’d enjoyed a few weeks back, taking on a slightly longer and more strenuous walk for me while she frequently put me in mind of Kate Bush while she ran up that hill with no problems. It occurred to us as we walked and talked and dodged the rain and avoided the temptation to run away and join Zippo’s Circus which was setting up adjacent to the car park that, although we’ve known each other for a long time, we could not have had such a wise discussion in earlier years nor (in my own case) even just a few days earlier. We are both keen students of personal development and well-read and opinionated too. We are very definitely not of one mind, which makes for healthy discussions and learning to love and accept ourselves and each other exactly as we are. We’ve listened to each other whinging on for years and either we genuinely don’t remember or we are loving enough to pretend we don’t. The thorniest problems are not solved overnight, though they could be knowing what we now know. And after all these years of study and debate we are beginning to scratch the surface of “the problem”, this problem called Life. The problem is us and how we decide to respond to the world; the assumptions we make, the viewpoints we take up, the choices we pick when our buttons are pushed. At the outset of our day out our problems could, in some lights, be regarded as thornier than ever. But at the end of the day, they were lighter and easier and not just because we’d had a chance to talk them through and offer each other a damned good listening to and the opportunity to be challenged, lovingly. Lighter and easier because we’d realised that the difficulties begin and end with us, and no matter how “bad” they may seem in some lights, everything is absolutely fine. All we have to do is change how we look at things and how we respond to everything and everyone. And that all we can do is change ourselves. We are now officially a couple of Wise Old Birds, me the oldest at six months shy of a bus pass. Hampstead Heath is very beautiful and that helps. We were just two people putting the world to rights, amongst hundreds walking and enjoying themselves, nature, the views, their dogs, the sunshine on the trees and the grass in early autumn. The odd handsome actor walking by, and smiling, doesn’t do any harm either. We did thrash about a few ideas for the future of each other’s businesses but the thing we most decided to change was ourselves. 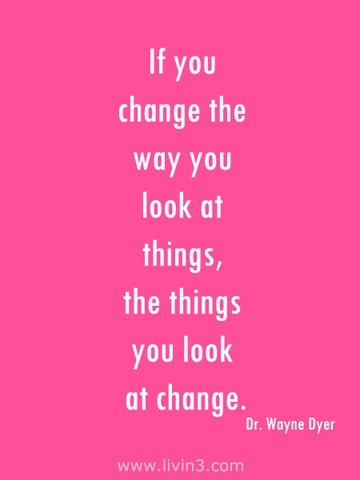 Specifically the way we look at things. One of my clients is a very wise woman too and she’d given me a useful concept in a conversation earlier in the week about how to deal with other people’s shortcomings by simply expanding oneself, which is a nice variation on the theme I have been practising now for a couple of weeks, that of loving the most challenging people in my life, those I know and those I don’t (like Jeremy Clarkson, for starters, and the latest Tia Maria advert on the billboards on the side of the road). And it’s working. I do feel that my personal development study is being nudged into a Buddhist direction. I am intent upon understanding the human condition and being resourced in the way that I deal with what I perceive to be my own problems and also that any wisdom I acquire along my own journey can also help my clients. If I could sum up our day it was that we both left with a resolution to choose to have a wonderful life, a sweet life. And overnight, when contemplating writing my Friday newsletter, I remembered again the concept of Dolce Far Niente, what the Italians call the sweetness of doing nothing. I could do with some more practice at the sweetness of doing nothing. I did nothing very much on Thursday except take the day off midweek and go for a long walk and a long chat with a friend. And if that’s not why we are self-employed, I don’t know what is. Every day it is our choice and our opportunity to have a sweet life, to make the choices which allow us to remember that we have a wonderful unique life, we are living it now. Our problems are only as bad as we make them so. Your life is uniquely yours to live and if you don’t live it fully, it will go unlived. Choose the sweet life, every time.